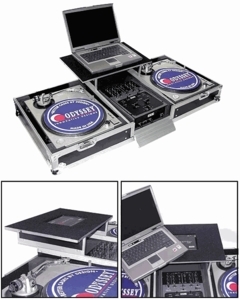 An Odyssey exclusive, our Glide Style turntable console is made to house 2 turntables in "battle mode" and 10" mixer. Above the center-mounted mixer, a gliding laptop platform slides out on a unique rail system, which contains a hidden space within the platform which can house a Rane Serato unit. This patent pending design locks into place away from the mixer area, leaving plenty of space for mixing. Includes wheels for easy transport. Note: The gliding laptop platform can be positioned as needed. For the safety of your equipment, please be aware that the platform can be removed when slid out to it's furthest point.